REF: Guidelines of Swachh Vidyalaya Puraskar 2017-18, issued by Ministry of HRD, Government of India. 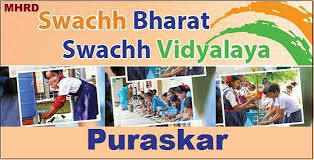 As in reference cited, Ministry of Human Resource Development, Government of India has started Swachh Vidyalay Puraskar as part of the Swachh Bharat-Swachh Vidyalaya initiative to motivate the schools towards cleanliness and retention of attendance of students with a healthy environment. On successful initiation from Sarva Shiksha Abhiyan, Amaravati, the maximum no. of schools have been participated in Swachh Vidyalaya Puraskar(SVP) 2017-18, Of these, the best 40 schools are selected at State Level Award in SVP 2017-18. Hence, the Award Ceremony for selected 40 schools at State Level and also 21 schools selected in SVP 2016-17 on best components (Water, Toilets, Hand Wash, Operations & Maintenance and Capacity Building & Behavior change) has been organized at Vijayawad, on March 22nd , 2018 as part of the " World Water Day ". Sustainable Development Goal (SDG) places heavy emphasis on the provision of safe drinking water, sanitation and hygiene (WASH) and provision of WASH components in schools will directly contribute to Goal 3 - Good Health, SDG Goal 4 -Quality Education, SDG Goal 6 - Clean Water and Sanitation and other relevant goals. A WASH component in schools plays a significant role in determining the health of children, attendance, dropout rate, and learning outcomes. The provision of water, sanitation and hygiene facilities in school secures a healthy school environment and protects children from illness and exclusion. It is a first step towards a healthy physical learning environment, benefiting both learning and health. Children who are healthy and well-nourished can fully participate in school and get the most from the education being imparted. In 2014, The Ministry of Human Resource Development, Government of India launched ‘Swachh Bharat Swachh Vidyalaya’ (SBSV) initiative to ensure that all schools in India have access to separate functional toilets for boys and girls. The initiative also has its emphasis on promoting safe and appropriate hygiene practices in schools and behavior among children and focuses on improving facilities. Later, MoHRD also come up with a novel idea of assessing the WASH facilities in schools and reward the school where the WASH components are being maintained properly. For this Government of India launched the Swachh Vidyalaya Puraskar (SVP) 2016-17 to recognize and celebrate excellence in school sanitation with technical and knowledge support from UNICEF and Administrative Staff College of India(ASCI). In line with the national mission and also to contribute to the state vision 2029, Hon’ble Chief Minister announced the vision of Swachh Andhra Pradesh and directed various line departments to focus the component as high priority. Sarva Siksha Abhiyan, Department of School Education (DSE), Andhra Pradesh has been implementing a series of activities and schemes to ensure improved and sustainable water, sanitation and hygiene (WASH) facilities in schools as part of Swachh Andhra Pradesh initiatives, which result in providing an enabling environment for children and contribute to achieve, Sustainable Development Goal 3 (Good Health), Goal 4 (Education) Goal 6 (Water, Sanitation) and also contribute to other international and national development goals. With the results of continuous technical support from UNICEF during the academic year 2016-17, various initiatives by the sarva siksha abhiyan, education department and greater participation of majority of the schools, the state stood in 2nd position and received National Swachh Vidhyalaya Puraskar 2016-17. Total 21 schools in the state have obtained National awards. In continuation of Swachh Vidyalaya puraskar 2016-17. To continue the success rate of previous year, with the results of various interventions implemented as part of WASH in Schools project supported by UNICEF and constant efforts from state to the school level key stakeholders, a total 58,802 schools (Govt, Govt. Aided & Private) have been registered out of 62,561 schools in Swachh Vidyalaya puraskar 2017-18 and among these registered schools, 49,627 schools have been evaluated at district level in Swachh vidyalaya Puarskar 2017-18. After the district level verification, state team verification and as per the guidelines issued by the Ministry of Human Resource Development, Government of India on Swachh Vidyalaya Puraskar and to motivate all the schools towards the Swachh Bharat- Swachh Vidyalaya , the award ceremony is held for the 40 schools which have been selected at State Level. The selected 40 schools will be under go for physical verification by the National Team to select the best schools at National Level award in Swachh Vidyalaya Puraskar 2017-18. Sustainable Development Goal (SDG) places heavy emphasis on the provision of safe drinking water and sanitation. Among the 17 Goals of SDG, three of them are WASH-related: SDG Goal 3 - Good Health, SDG Goal 4 -Quality Education and SDG Goal 6 - Clean Water and Sanitation. Improved Water, Sanitation and Hygiene (WASH) facilities in schools are key components to achieve Sustainable Development Goal 4 i.e. “ensure inclusive and equitable quality education and promote lifelong learning opportunities for all”. Awareness, knowledge of proper usage, operation and maintenance (O & M) of WASH facilitates in schools are critical areas to be improved. With the call from Hon’ble Prime Minister to achieve Swachh Bharath and Swachh Vidhyala, many corporate companies and non government organizations have paid an attention towards constructing the school toilets and improving infrastructure, apart from the government counterpart. Government also set up its own target and constructed large scale of toilet facilities ensuring initially separate toilets for girls and boys. With this movement, a large scale of toilet construction has been taken up. As part of World Water Day Celebrations i.e. on 22nd March 2018 and also to recognize the excellency of the Head Masters, Teachers and other key stakeholders in addressing WASH components in schools and reaching the best score in Swachh Vidhyalaya Puraskar Ranking, it is proposed to organize a one day Award Ceremony at Vijayawada by the Sarva Siksha Abhiyan, Education Department, Government of Andhra Pradesh. Awards / Certificates will be given to the Selected 40 schools to motivate the other schools in the state and key stakeholders for better performance in improving and maintaining sustainable WASH facilities to contribute to the state, national and global priority development indicators.